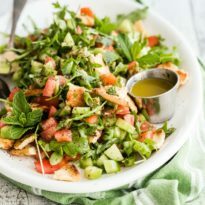 If you find yourself in a salad rut, as we all do from time to time, Fattoush will get you right out of it. Versatile, simple, and healthy— fattoush is destined to be your new salad best friend! Adjust oven rack to middle position and heat oven to 375 degrees. Line a baking sheet with foil for easy cleanup and top with a wire rack. Using kitchen scissors, cut around the perimeter of each pita and separate into 2 thin rounds. Cut each round in half. Place pitas, smooth side down, on prepared rack. Brush surface of pitas with oil and sprinkle with salt and pepper. Bake until pitas are crisp and lightly golden brown, about 10 to 14 minutes. Let cool to room temperature and break into 1/2-inch pieces. In a small bowl, whisk together lemon juice, sumac, garlic, and 1/4 teaspoon salt and let blend at room temperature for 10 minutes. Whisk in 1/4 cup olive oil. Place broken pitas into a large bowl. Add tomatoes, cucumber, arugula, cilantro, mint, and scallions. Drizzle dressing over salad and toss to coat. Season to taste with salt and pepper. Garnish with additional sumac if desired.